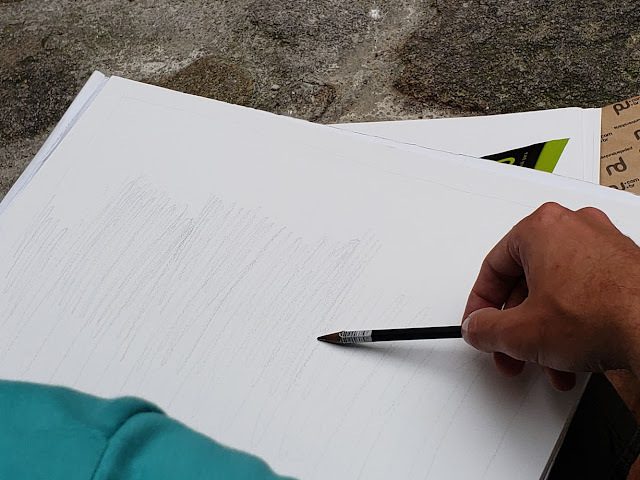 A discussion of Graphite is the Matter, the workshop I took with Eduardo Bajzek, requires its own post because I am so intrigued by the process he uses that I want to document it thoroughly as a reminder to myself. 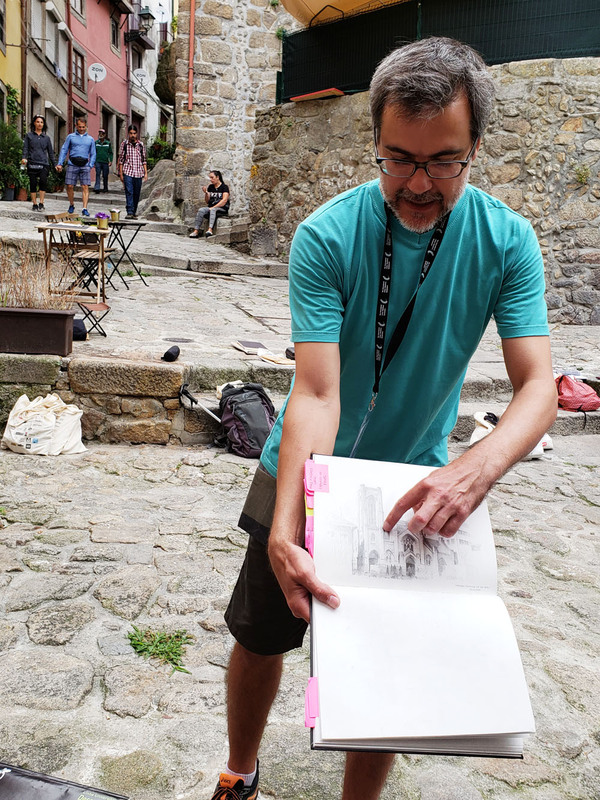 As happened with nearly all symposium activities, Eduardo led us on a steep, lengthy hike to his workshop location. A relatively quiet, pedestrian-only alley had tables for a small café and, as always, tightly stacked buildings forming a canyon. 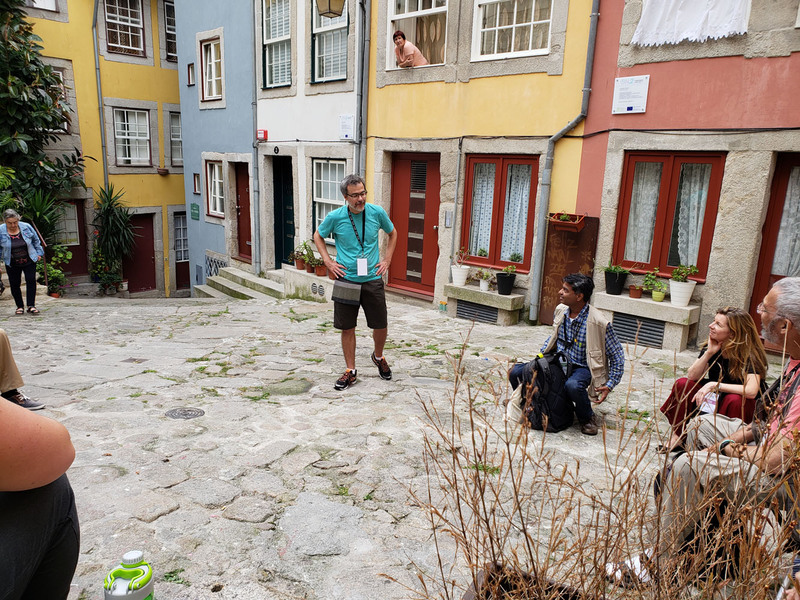 To begin the workshop, Eduardo encouraged us to relax and prepare for the work ahead by sitting in silence for two full minutes with our eyes closed. He didn’t call it meditation, but he said he begins his own drawing and work practice this way to relax and quiet his mind. 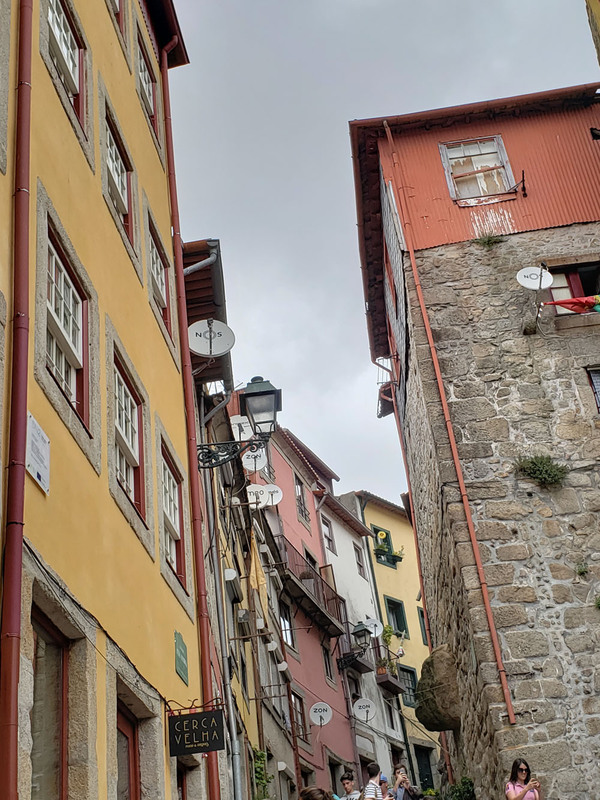 After the physical exertion of hiking uphill, my mind buzzing with thoughts about the symposium and conversation with other participants, it was a surprising and delightful way to begin. 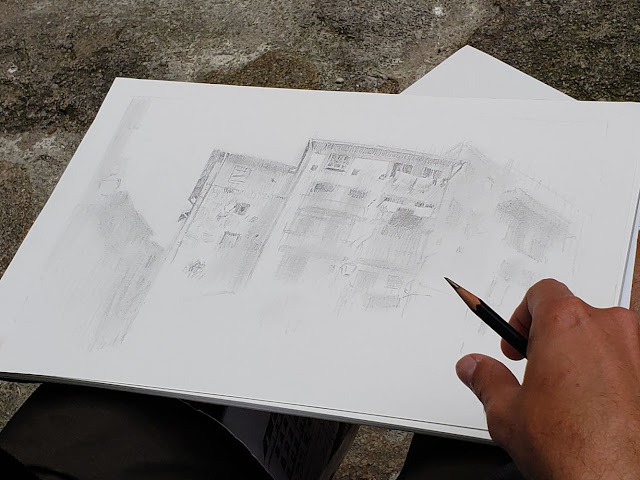 The technique of using simple tools – pencils, erasers and a blending stump – to build forms with the matter of graphite. The concept of working from the outside in – from larger shapes to progressively smaller ones. Because his method can be time-consuming and he knew he wouldn’t be able to demo a complete drawing large enough for all to see easily, Eduardo prepared for the workshop in an impressive manner that I really appreciated. Several days before the workshop, he scoped out his location and then spent more than two hours on a drawing. Another day, he came back to the same location and started a new drawing of the same view, this time stopping after about an hour. For the workshop participants, he pulled out a clean sheet of paper and started a fresh sketch – again of the same view. 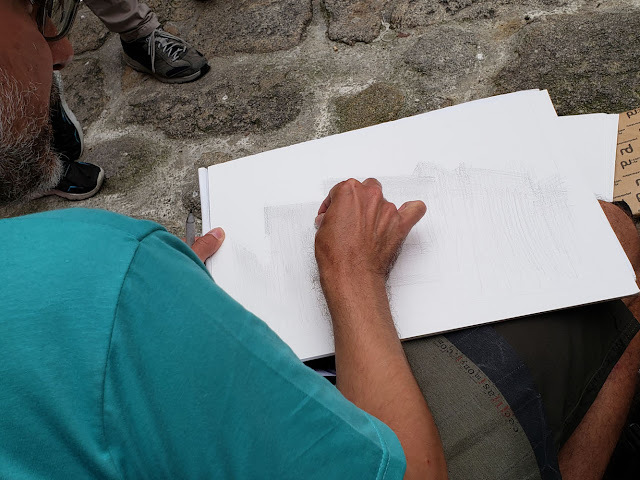 The demo itself lasted only about a half-hour, but because he could show us two more versions of how he might continue working on the drawing, we could see his additive process of honing the work and shaping the matter of graphite. At each stage, the drawing looked relatively finished, and the main difference among them was the level of detail added. If a composition is strong and the values read well, then a drawing can have very little detail and still look finished. Before beginning to draw, he talked quite a bit about observing closely to select a strong composition, but defining the drawing’s focal point is not important early in the game. This surprised me a bit, as I always find myself honing in on a focal point almost immediately before starting a sketch, as it’s usually the first thing that catches my attention. Another thing that surprised me was the very specialized material he used for blending large areas of graphite once he had scribbled on the initial tone: toilet paper! This tool hadn’t appeared on the supply list, but he laughed as he explained how handy it is. (If you’ll recall, I said in my workshop prep post that I already own so much of everything that I didn’t have to buy a single item for the symposium. It turns out that I was also prepared with this item! I’ve had enough experience traveling outside the US that I always carry a partial roll of TP everywhere for its more conventional purpose in public restrooms. 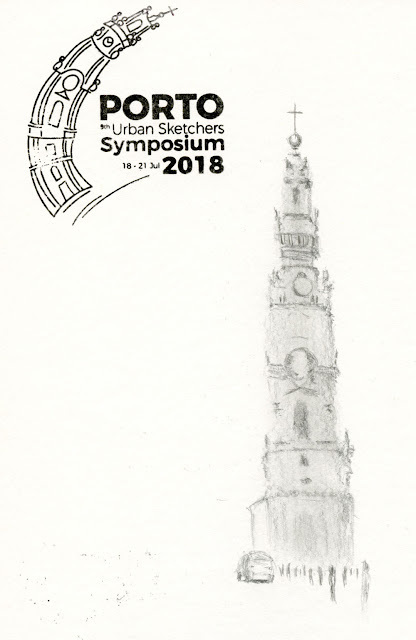 I never thought I’d use it during an urban sketching workshop!) The purpose of this step is to blend and unify the composition by making the tone as solid and even as possible. I was also surprised that he used a Staedtler 3B grade for this initial scribbled and blended tone. I would have guessed that a slightly harder, lighter grade would be used initially (with gradually softer, darker grades used later), but he prefers using softer grades to avoid making inadvertent indentations in the paper and to make the application of tone go faster. 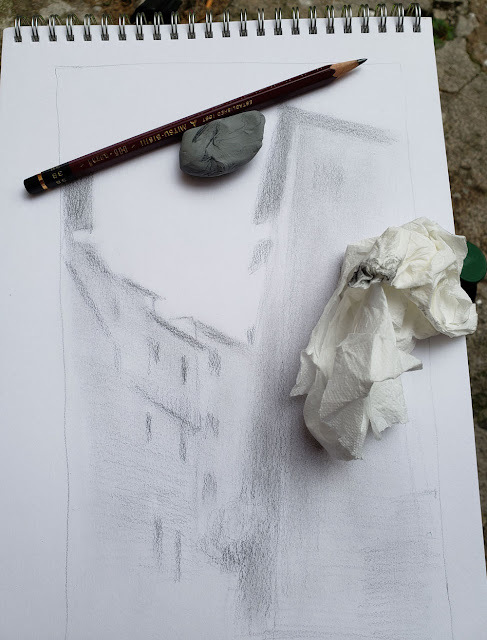 After that, the process was continual repetition of the previous cycle: Add more tone, this time more selectively; smudge with toilet paper and, when a finer stroke was needed, the blending stump; use the eraser to sharpen edges and continue to shape the forms. In a half-hour, he had produced a sketch that wasn’t quite finished but that had enough clearly defined forms and values that it “read” easily. The one-hour and two-hour samples he had prepared previously helped us visualize how he might have continued many more cycles of tone/blend/erase with the addition of sharp details to provide the focal point. Now it was our turn. 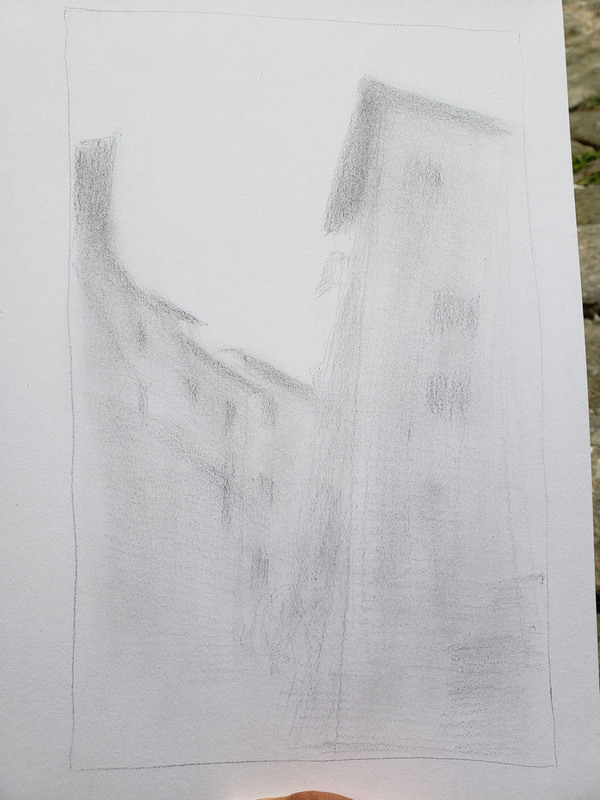 I chose a relatively simple composition of the main canyon of buildings on either side of the pedestrian alley for its lack of detail. I thought this would keep me from being tempted to fiddle with too many lamp fixture curlicues. I also avoided identifying a focal point. 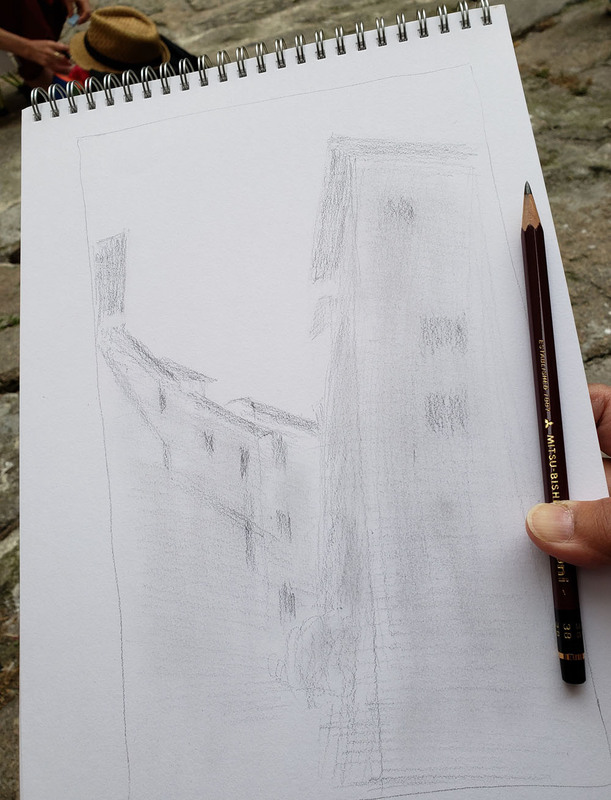 As I mentioned, resisting the impulse to “draw” the building contours was similar to resisting gravity – it felt very physical! 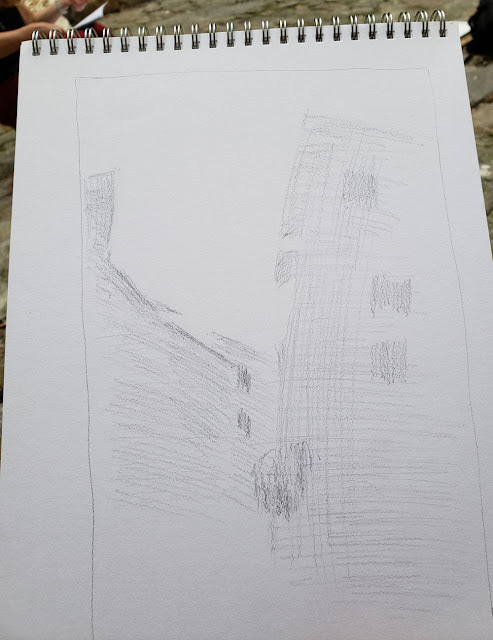 I had planned to photograph my sketch at each stage as a reminder, but I don’t have a photo of that initial laydown of tone because I was too busy fighting my own arm, hand and pencil point. 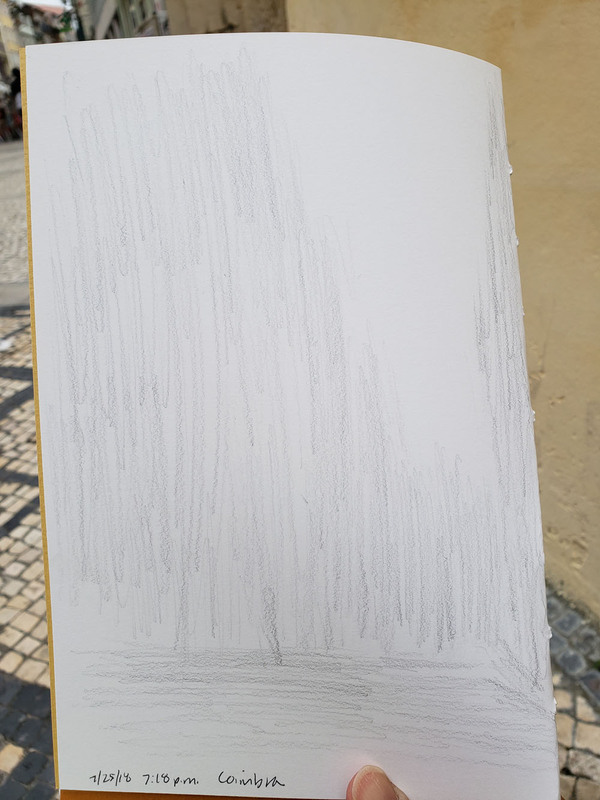 By the time I thought to take the photo below, I had already begun defining the shapes with the eraser and later the pencil point (that’s allowed, but only after the eraser has done the initial job). 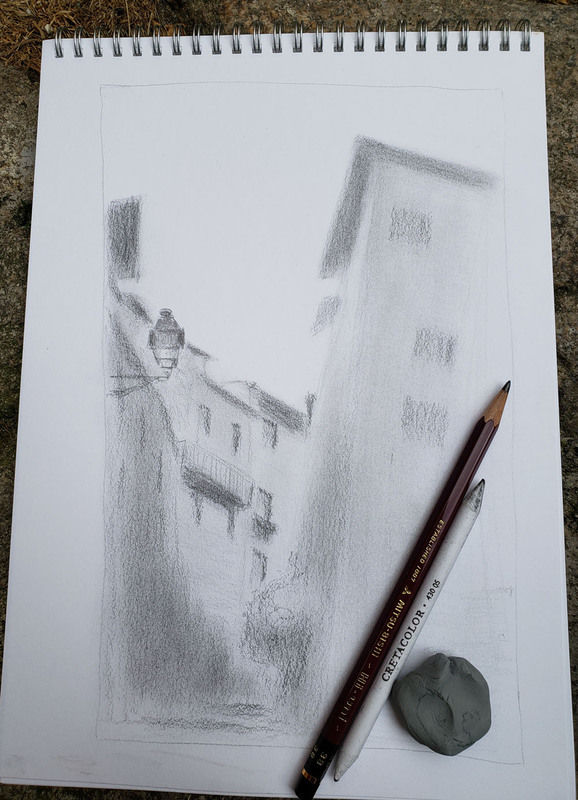 Early stages of my sketch: Tone applied; shaping with eraser and pencil point begun. When Eduardo came by to check on me, he encouraged me to use the TP more often to unify the composition. I said I didn’t want to smear the areas I had already started darkening, but he said not to worry about that until I was ready to work on fine details toward the end. At this stage, it’s still all about value and tone, and the nice thing about graphite is that the darker areas will always remain darker, even if TP’d, because of its layered, cumulative nature. Eduardo suggested more use of the TP to unify the composition. It was this late in the game that I finally decided to put in a lamp fixture with fine detail as the focal point. Using nothing but a Mitsubishi Hi-Uni 3B (which is slightly softer than a Staedtler of the same grade), I worked for about an hour and a half on this drawing. (I meant to switch to a softer grade as I worked on darker areas, but I forgot.) I stopped before the end of the workshop because I was afraid I was going to start getting fiddly if I kept going. Perhaps more important, I really liked the way my sketch was at this point (top of post). I mentioned in my previous post that I often don’t like work I produce in workshops because it tends to feel like exercises or reflect the instructor’s vision more than my own. In this case, I was using an approach and technique that are distinctly Eduardo’s and not my own, yet I ended up pleased that I could follow both and still end up with a sketch that I like. 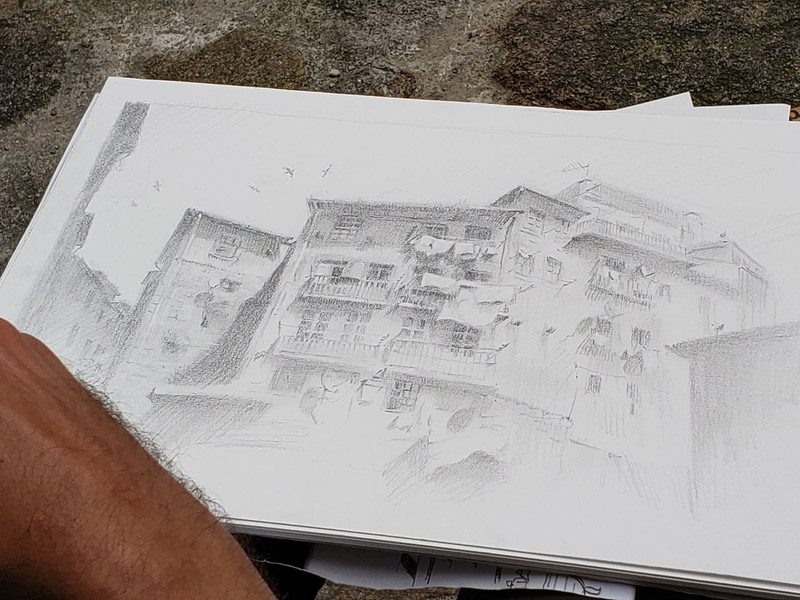 The challenge with learning a distinctive technique that is clearly associated with an instructor who teaches it is that I don’t want my sketches to simply be bad imitations of Eduardo’s work. 😉 That remains an issue for me – I want to find a way to use this technique and make it my own. Once I finished stuffing my brain back into place, I went out immediately and tried using what I had just learned on a very small sketch of the Torre dos Clerigos (at left). This is exactly the type of building that I would normally draw with a fountain pen, initially enjoying all the tiny details but then getting lost in those same details. Using this tonal method, I was forced to focus only on the broad shape first. On this small sketch, I used the stump to blend, and I also used the fine edge of the Tombow Mono Zero eraser to define lines instead of the kneaded eraser. 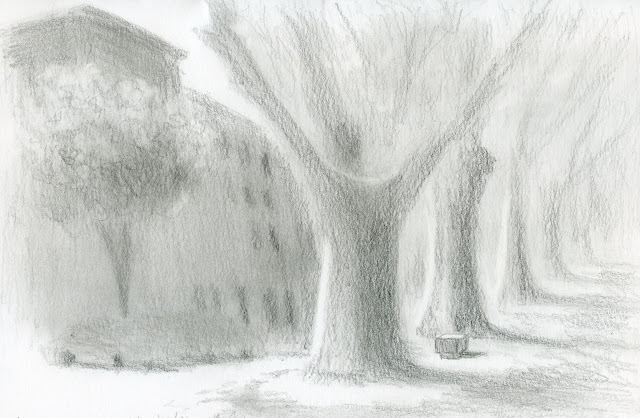 A couple of days later during a sketch walk in the Vertudes neighborhood, I was attracted to the light on some trees that looked like it would be just right to practice the technique again (below). I used nothing but the 3B pencil again, but in retrospect, I should have used a softer grade later to bring out the darks more. Several days later in Coimbra, I made a sketch that turned out to be my favorite of the entire trip (below). You’ll see this sketch again later when I talk about my trip highlights (and lowlights), but I wanted to show it here because this time I remembered to take a photo of the initial toning step. I don’t expect many of you to have kept reading through this lengthy post, but if you did, I hope you found this process as fascinating as I did! Thank you, Eduardo, for a mind-blowing workshop! How facinating! It's like sketching backwards, isn't it? I tried Marc Holmes's challenge privately (not posting) and I can see why you felt the struggle. But the last sketch is really good. 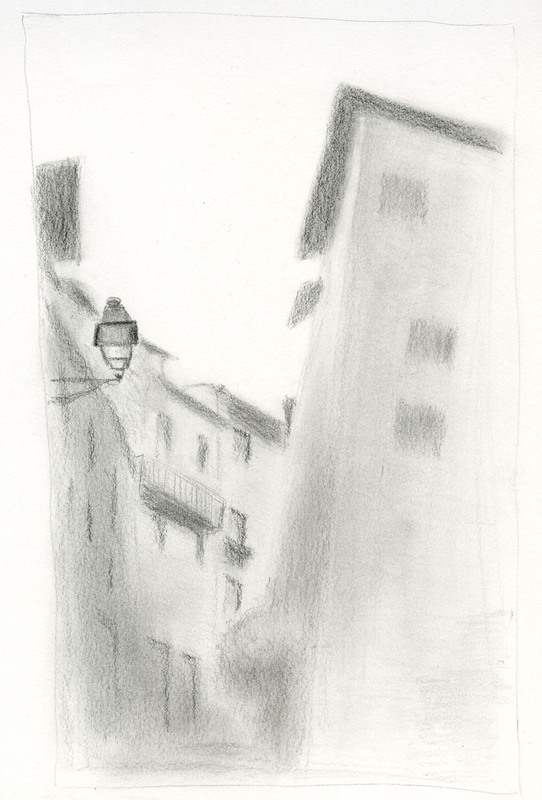 "If a composition is strong and the values read well, then a drawing can have very little detail and still look finished." I love it! Oh, I was hoping that we'd connect again before you went far away! 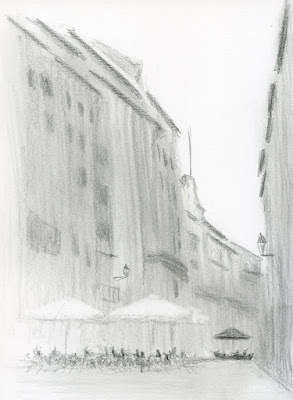 :-( Keep sketching and posting. . .I'll keep following you online, wherever you go! I can't imagine doing a drawing without my hand doing lines. lol That must have been hard to resist. I enjoyed reading your description of his method and seeing all your sketches where you practiced this approach. Great job! I think having the time to practice the method immediately is an important part of incorporating it into your mind.